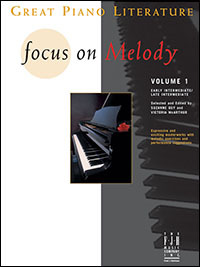 Focus on Melody, Volume 1 contains piano literature with a wide variety of melodic treatments aimed at helping performers develop the skill of recognizing melodic features. The cleanly engraved scores are organized by period, in approximate order of difficulty. Includes hints about finding and projecting melodies, technical exercises for melodic expression, descriptive summaries, and brief composer biographies. Gymnopedie No. 1 (Satie) and Le Petit Negre (Debussy). 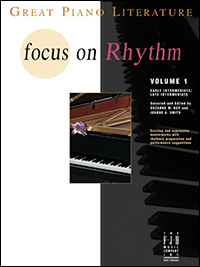 As part of the Great Piano Literature series, Focus on Rhythm, Volume 1 is a collection of 32 carefully selected and edited pieces from the four major style periods. This selected repertoire explores the many different rhythmic patterns and combinations inherent to the music, with special exercises for rhythmic preparation and descriptive summaries highlighting the rhythmic content in each piece. This approach provides the right amount of attention needed to attain a thorough understanding of rhythm and precise performance interpretation. The second installment of this exceptional piano literature series continues to strengthen a student's ability to find and project melody. The music represents a variety of keys, tempi, meters, and style. Includes technical exercises for melodic expression, descriptive summaries for each piece, and composer biographies.